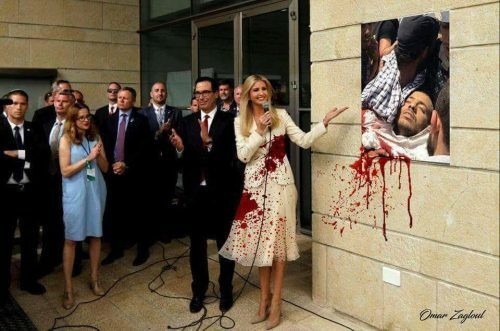 On May 14, 52 Palestinians in Gaza were killed and 2,400 others wounded—500 of whom were hit by live ammunition while they protested the US embassy move to Jerusalem. Of those killed, at least six were under age 18, including one female. Of the wounded 200 were under the age of 18, 78 were women and 11 were journalists. What was their protest? Gazans set up tent camps 500-700 meters from the border fence that Israel had built to contain them. 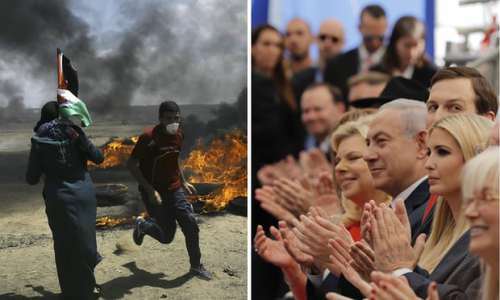 The Gaza Strip is only 32 km from Jerusalem, where functionaries and diplomats from the US and its client states such as Cameroon, Czech Republic, Paraguay, Honduras and Guatemala helped the US celebrate its embassy’s move to Jerusalem. Months ago, at the United Nations, only 9 states supported the US moving its embassy from Tel Aviv, while 128 countries, including Germany and France, opposed it. Monday’s massacre was in addition to the more than 39 Palestinians killed by Israel and the nearly 8,000 injured during the last six weeks of protests, called the Great March of Return. According to B’tselem, of those injured, the Israeli Defence Forces (IDF) have shot more than one-quarter, or 2100 Palestinians, with live ammunition. Gaza doctors have reported particularly serious injuries, mostly to the lower extremities, that “include an extreme level of destruction to bones and soft tissue, and large exit wounds that can be the size of a fist.” According to Palestinian Ministry of Health Data, as of 30 April 2018, Gaza doctors had performed 24 amputations on wounded individuals, 19 of them of lower limbs. To date not one Israeli soldier or civilian has been killed or injured. Though the CBC insists on calling the cutting down of Palestinians “clashes,” there have been no “clashes” in Gaza. The IDF shot unarmed Palestinians as thousands massed near the fence that imprisons the 1.8 million inhabitants of Gaza, the biggest open air prison in the world. While some Palestinians did carry stones and slingshots, none had guns. The IDF had tanks, helicopter gunships, machine guns, drones loaded with teargas and snipers. We hear Israeli Jews, and many Canadian Jews, echo these questions. In the wake of Land Day 2018, Palestinians launched protests over six weeks to demand the Right to Return to their homes that were stolen by the Israelis, some in 1948 and more in 1967, as well as to protest the blockade of the Gaza Strip. In response, after all the carnage and the terror the Israelis unleashed on Gaza, we heard the Israeli Occupiers blame their Palestinian victims. Jared Kushner, President Trump’s son-in-law and senior advisor, minimized concerns about the Israeli army killing unarmed civilians in Gaza. “We stand with Israel because we both believe in human rights, democracy worth defending, and believe that we know that it is the right thing to do,” he said. His comment means that whatever Israel does is just fine with the US. According to some journalists on Monday, they saw dozens of unarmed Arab-Israelis beaten and arrested by Israeli security forces outside the new US embassy in Jerusalem. This elicited cheers from Israeli demonstrators who came out to support the embassy’s opening. As Israeli security grabbed the Arab-Israelis, the Israeli Jews chanted, “Burn them”, “shoot them”, “kill them”. Israeli army spokesman Lieutenant Colonel Peter Lerner insisted that all the killing and maiming the IDF carried out in Gaza did not “change the fact that Hamas set out 7 weeks ago to ruin this day in Jerusalem.” Unarmed Palestinian civilians are mowed down by the army and that same army blames Hamas for “trying to ruin” Israel and the US’s celebration in Jerusalem! If not now, when is the time to protest what Israel is doing? When is the time to “break ranks” with the establishment Jewish community in Canada – and say enough is enough? Now is the time for Canadian Jews and anyone who supports human rights and opposes the Occupation to speak up.